Vespucci and Alonso de Ojeda. Spanish resume de facto rule in 1546. 27 May 1717 - 11 May 1724 Subordinated to Nueva Granada (see Colombia). 11 May 1724 - 20 Aug 1739 Subordinated to Santo Domingo. 20 Aug 1739 - 8 Sep 1777 Subordinated to Nueva Granada. of Santo Domingo to 1786. 8 Sep 1777 Separate Captaincy-general of Venezuela (incl. 31 Jul 1786 Audiencia of Caracas established. to Britain 1802)(see Trinidad and Tobago). 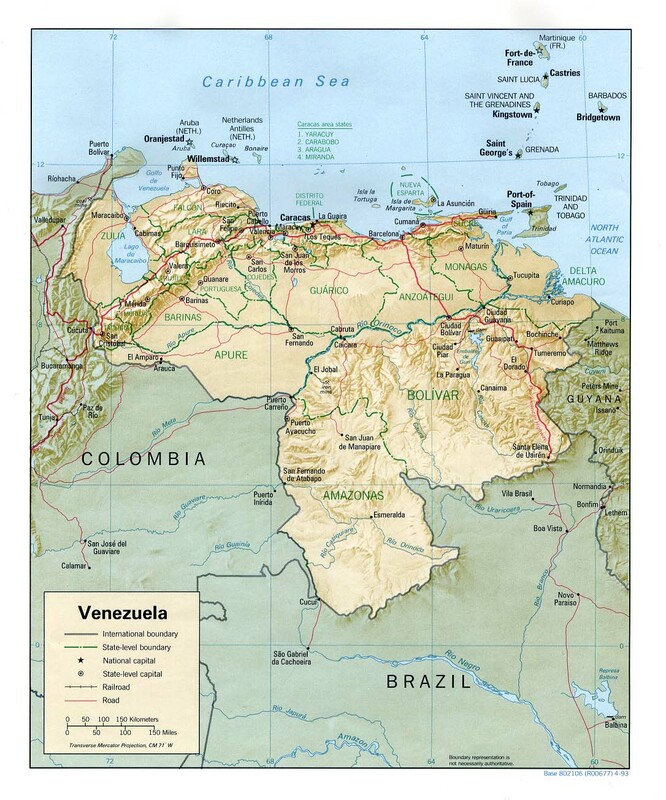 19 Apr 1810 - 8 Nov 1823 Venezuelan war of independence. 25 Jul 1812 Reconquest by Spain. 7 May 1816 Renewed independence (Republic of Venezuela). 8 Nov 1823 Puerto Cabello last Spanish royalist base surrenders. official use to 20 Jan 1835]). 22 Jun 1846 Spain recognizes the independence of Venezuela. 9 Dec 1902 – 19 Feb 1903 Germany, Italy, and U.K. imposed a naval blockade. ¹The weekly rotating chairmanship was occasionally held by alternate members: Manuel Moreno de Mendoza y Salas (b. 1755 - d. 1841)(alternate to Mendoza), Mauricio Ayala Soriano (b. 1774 - d. 1813)(alternate to Escalona), and perhaps also Andrés de Narvarte y Pimentel (b. 1781 - d. 1853)(alternate to Padrón). 2Due to the ambiguous situation caused by the fact that Hugo Chávez (s.a.) was prevented by illness from taking the oath for his next presidential term, which he nevertheless was deemed to have begun on 10 Jan 2013, it is initially unclear whether the vice president, Nicolás Maduro Moros (s.a.) (as provided in the constitution for the regular case of the death of a sitting president), or the president of the National Assembly, Diosdado Cabello Rondón (s.a.) (as provided for in the case of an elected president dying before being sworn in), becomes acting president. The government adopts the first interpretation, and it is confirmed by the Supreme Court on 8 Mar 2013, which rules that Maduro became acting president immediately on the death of Chávez and then ceased to be vice president; later on 8 Mar he is sworn in as acting president. Territorial Disputes: Claims all of the area west of the Essequibo River in Guyana (as Guayana Esequiba or Zona en Reclamación), preventing any discussion of a maritime boundary; Guyana has expressed its intention to join Barbados in asserting claims before the United Nations Convention on the Law of the Sea (UNCLOS) that Trinidad and Tobago's maritime boundary with Venezuela extends into their waters; dispute with Colombia over maritime boundary and Venezuelan-administered Los Monjes islands near the Gulf of Venezuela; Colombian-organized illegal narcotics and paramilitary activities penetrate Venezuela's shared border region; in 2006, an estimated 139,000 Colombians sought protection in 150 communities along the border in Venezuela; U.S., France, and the Netherlands recognize Venezuela's granting full effect to Aves Island, thereby claiming a Venezuelan EEZ/continental shelf extending over a large portion of the eastern Caribbean Sea; Dominica, Saint Kitts and Nevis, Saint Lucia, and Saint Vincent and the Grenadines protest Venezuela's full effect claim. claim disputed by Netherlands, U.K. and Venezuela. 30 Dec 1854 Claimed by Venezuela, Dutch and America are traders evicted. 14 Jan 1859 By Convention U.S. settles its claims in favor of Venezuela. over Aves Island to Venezuela. 23 Aug 1972 Made a nature preserve. Aves and Puerto Rico (ratified 24 Nov 1980). over a large portion of the Caribbean Sea. Aves and Guadeloupe and Martinique.